Summary: The Bell + Howell Silver Sonic XL has the ability to give you sonic hearing, easily amplifying sounds up to 90 feet away. 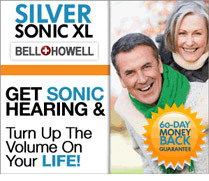 The Bell + Howell Silver Sonic XL has the ability to give you sonic hearing, easily amplifying sounds up to 90 feet away. Never miss out on a conversation, game or TV show ever again! # Amplifies sounds up to 90 feet away!